Bio: Danielle Ferrin was born and raised in sunny Minnesota until four years ago when she moved to Ashburn with her husband of 16 years, Mike, and their 4 kids. She has done many jobs in her lifetime, usually involving some form of creativity, and loves connecting people, hearing their stories, stretching and encouraging them, laughing, hiking, painting, and finding random things at auctions or thrift stores. Besides being wife/mom of many, she owns a company, Fun Places, that designs and creates spaces for kids, and is a substitute teacher for Loudoun County Public Schools. The Care ministry’s vision is to be Christ’s heart and hands tangibly in this church and world any way we can. In following Christ’s commands to “love one another,” “carry each other’s burdens” and “comfort those in trouble,” we know we are blessed back in serving, supporting and sharing. These ministry areas include meal delivery, moving help, card encouragement-writing, providing Sunday snacks before service, helping with practical needs, and sharing resources with each other. Please pick up a Care Team brochure in the gathering area and sign up with your interest on the forms near the food. Join us and participate in the beautiful mess of needing each other. You can contact her at: Care@bridgeloudoun.com. Family: Randy and Suzanne have been married for 20 years. They have three beautiful daughters: Laura, Allison, and Nicole. Their passion is for their family to put God first and to live in the identity and purpose to which He has called them. Experience: Both Randy and Suzanne have personal, daily, experience of learning to hear from God, and putting that faith into action. Both love to help others along their journey to find the same peace, joy, and growth that they have been blessed with through a close personal relationship with the Lord. Individually Randy and Suzanne have led many individuals through the process of listening prayer, and together they work to restore, heal, and improve marriages through the same concepts. At Bridge Community Church Randy and Suzanne are leaders for the marriage ministry and it is their desire to see all marriages flourishing with God's direction and guidance. Hobbies: Randy and Suzanne love to spend time with their girls. Most weekends are spent having fun as a family. Recently they were blessed to spend 3 weeks traveling around Europe. From that trip we learned that investing in our relationships with our kids means we really, truly do like each other, and the trip was a fantastic success. You can contact Randy and Suzanne at Couples@bridgeloudoun.com. Family: Nick grew up in Minnesota, and went to school at Iowa State, before moving to Cedar Rapids, Iowa where he met Jackie. Nick and Jackie met in a young adult ministry at church there and got married a few years later. They’ve been married since 2005 and moved to Virginia in early 2015. Nick and Jackie have 1 fur baby (Olive), and love spending time with other people’s kids as well. Experience: Nick has a BS in Aerospace engineering from Iowa State University and has been working in the engineering field for 16 years. He has been a manager of people for the last 8 years. Nick has served as a leader of Men’s ministry at New Covenant Bible Church in Cedar Rapids, Iowa where he also served as a Deacon for the Middle Adults for 3 years. Nick is currently serving on the ELT with Bridge Community church as well as leading the Men’s ministry. Jackie and Nick previously served as the Community Leaders with Bridge Community Church. Nick looks forward to engaging with people and understanding what they are looking for in order to grow deeper in their own spirituality and connect with others. Hobbies: Nick loves to spend time cooking food for both his family and for others (Vegan food please, it really is good! ), likes running, spending time outdoors, reading, watching movies and playing board games. There may not be a person much more competitive than Nick. Passion: Priscilla Tipeni is currently serving as the Prayer Ministry Leader at Bridge Community Church in Ashburn, Va. She is also a small group leader in the High school ministry, prayer minister on the Encounter Team at Christian Fellowship Church (CFC) and currently serves on their Board. Her deepest passion is to come alongside the youth and show them who they are and most importantly that they are sons and daughters of the living risen King Jesus Christ. While delivering this message, she hopes to empower and guide them to do life in community with others while walking in their God given identities. Family: Priscilla is a native to Reston, VA attending both South Lakes and Herndon High schools and graduated from Strayer University with a B.S in Accounting and an MBA in International Business. She is blessed to have been raised in a house that spoke of the power in the name of Jesus. She has never been married but deeply treasures her favorite names “Auntie” and “Sister” with a nephew Semisi (13), a baby brother Jaden (11), and a younger sister Jena (33). Prayer Team: Her hope at Bridge is for the continued healing and a deepened thought and prayer life for those around her. Her heart is for the prayer ministry leaders to usher the congregation and those God has put in their path into the presence of God, to create a space for them to hear His voice clearly and consistently. If you are interested in becoming a “Bridge Prayer Warrior,” and want to learn about the various ways you can be a part of serving on the Bridge Prayer Warrior service team, please contact Priscilla Tipeni at Prayer@bridgeloudoun.com. Come pray with us and see what God is doing in the lives of people today! Bio: Gaby was born and raised in Costa Rica. She moved to the United States in 1995 in search of better opportunities. 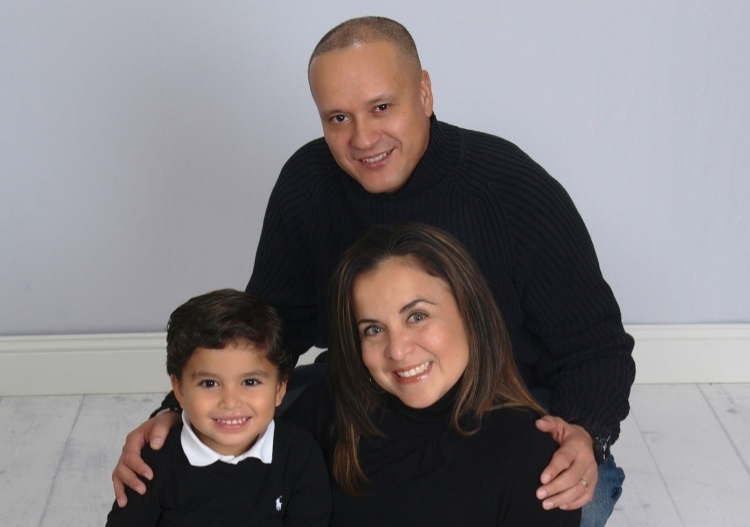 Gaby and her husband Eddy have been together since 1997 and they have a son, Gadiel (who sometimes greets you at the door!). They live in Sterling, VA and they enjoy traveling, mainly, going back to Costa Rica as much as possible. Gaby loves serving in any way she can. Gaby, Eddy and Gadiel have been on multiple missions trips since 2006 and they love to connect with friends and host BBQs!. Experience and Hobbies: She works as an IT Training Coordinator for a Contractor Firm, and during her free time enjoys ZUMBA, traveling, movies at home, shopping, cooking and playing Basketball with her 7 year old. Serving at BCC: Since Gaby joined BCC, she always looked for ways to help out. She helps with Announcements, the Greeting Team, the Kids Bridge Clubhouse and anything else people ask her to do. As the Web Presence & Social Media Team Lead, Gaby maintains the BCC Website, Facebook Page and our new Twitter Account. To serve on this team, you can email her at Info@bridgeloudoun.com. Family/Bio: Born in North Carolina into the Lumbee Nation, where both his parents are Native Americans, Eric is a long-time Virginian and has lived in Reston since he was 5 years old. He is married to Carolee and has 3 boys, Nicholas, Max, and Pierce and a dog named Gabby. Experience: A graduate of South Lakes High School and Virginia Tech, where he earned his bachelor’s degree majoring in finance. He also earned a master’s of business administration from Johns Hopkins University specializing in international business. He has over 28 years of budget and program management experience with the federal government and currently works as a budget officer for a climate research program at NOAA. Hobbies: An avid outdoorsman, Eric loves any activity outdoors from sailing to running, hiking, biking, and camping. He is also big into reading all genres of books with his favorites being personal journals of early American and other pioneers. Family: Carolee & her husband Eric have been long-time Reston, VA natives since 1974. They both stay busy with their 3 boys Nic, Max & Pierce and a dog named Gabby. Experience: A full time realtor with Coldwell Banker for over 10+ years and absolutely loves working with people. She's also involved in the local community, volunteers at Embry Rucker shelter weekly and Cornerstones. Hobbies: Carolee loves being active especially going into D.C seeing art exhibits, vacationing at the beach & cooking for her family. She really enjoys photography & creating collages plus listening to podcasts. Family/Bio: Melissa and her two daughters, Adriana and Taylor, moved to Ashburn, VA from Massachusetts in 2009 to pursue opportunities. Melissa and her daughters love to experience the beauty that Northern VA offers from the mountains to the city. They enjoy spending afternoons in Georgetown and Franklin Square Park as well as quiet outings west of the district to indulge in the serene environment of the mountains. Melissa appreciates spending quality time with both of her daughters from cuddling on the couch to being outdoors; living vicariously through her daughters with dance competitions, volleyball, basketball, and karate; and doing life with them as they serve locally and internationally. Interests/Hobbies: Melissa enjoys cooking, reading, going to Worship concerts, visiting Antique Shops, and experiencing new adventures. She loves to be surrounded by family and friends so when there is an opportunity to host or attend a gathering she will make it happen. Join her at the next Women’s Gathering! Ministry: Women's Connections are activities, events and outreach opportunities designed to be a fun time for women to connect with each other, in the hope that we can grow together and towards God by sharing life. We always love inviting new women to join us in our activities as a chance to love others in any way they need and to get a glimpse into our church. Any ladies with an idea for an event please contact Melissa at Women@bridgeloudoun.com. She is more than happy to assist in planning and executing an event. The goal is to have Women's Connections as unique, interesting and loving as the women of Bridge Community.